Hi, everybody. John Fischer, salesleads.tv. 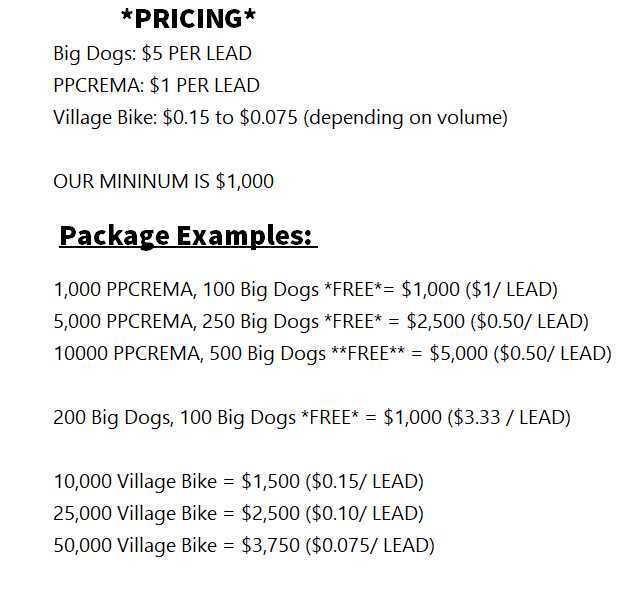 If you’re looking for the term ‘oil & gas leads, I wanna caution ya. They have such a thing as participation deals where you don’t have to be accredited; pretty much what you’re doing is buying a chunk of that particular well so they put together fifty guys. If they hit, everybody gets one-fiftieth of whatever the profits are. Most of these Accredited oil-and-gas deals are private-placements. And the private-placements require that, for the most part, the people are accredited. So I caution you on using terms like ‘oil-and-gas leads’or ‘oil-and-gas investor leads; I think I would use ‘accredited oil-and-gas investor leads’. Remember, if you don’t plug in that ‘accredited’ word, and if you’re talking to a list broker and not specifying, hey, by the way, I’m doing a private-placement, and my people are required to be accredited investors, you’re gonna end up buying a list of people that are not accredited, and get pissed off and probably lose your money. Why Would You Come To My Company Looking For Accredited Oil and Gas Investor Leads? One reason is because we’ve been in business for 26 years and have an A+ rating with the BBB. We’ve had no complaints. Try to find any of my competitors who have that record. Our business is rough and only the strong survive. What’s really happening is you have a lot of guys that are just peddling paper. It’s what we call “the village bike”. These are the leads that have been called over and over again. And the investors on their lists are getting pissed off. They’re complaining about getting too many phone calls. Those are not the leads you want to be buying. Now let’s talk about oil and gas investor leads. What is an Accredited Oil & Gas Lead? An accredited oil and gas lead is someone who is requesting information about oil and gas drilling ventures. When he decides to invest, he’s going to put in (hypothetically) $25,000 and will then own a percentage of that well. If his invested well hits oil, he will sell whatever is in the capacity tank, times how many dollars per barrel. Then, he’s going to get that percentage in a royalty check every single month. What is an Oil & Gas Investor? Oil and Gas Investors are people who invest in oil and gas deals. It’s pretty crazy, but some people really need to understand the definition, so they really understand what’s going on. Typically these oil and gas investments are done as a private placement. With the private placements comes the word “accredited” and accredited means that they have to have at least a $200,000 income for the last two years and at least $1 million net worth (not including their home); experience managing their personal portfolio and, of course, typically $25,000 to $50,000 of risk capital. So when people come to my website from doing a search on Google with the keywords “oil and gas leads”, or “oil and gas investor”, or “oil and gas investor leads” they have found the right place. The Right Search Term Might Save Your Bank? If you are looking for accredited oil and gas investor leads and simply do a search query on Google for “Private Placement Investor” or simply “investor leads”– you’ll end up finding (and buying) lead lists of investors who do not have the funds for investing in oil and gas. However, if you use the long tail keyword “accredited private placement investor” or “accredited oil and gas investor” you are more likely to find the right people for your investment opportunity. It’s very, very important. Otherwise, you’re going to end up with leads that are not going to work. Info USA – that’s what we call summarized credit, or modulated information where they take a zip plus four averages and assume that the guy is an accredited investor because he’s in the group of $200,000 income as income. That doesn’t work. What makes SalesLeads.tv’s leads better than everybody else’s out there is my people have been surveyed by brokers! Not by some clown in the Philippines, or some guy in Costa Rica, or some $10, $12 an hour American who doesn’t know what an accredited investor looks like. Our accredited investor leads are being surveyed by broker dealers. This guy’s hoping to make his 10% commission, when he talks – this guy is saying to himself, “Hey, I hope I get this guy. This guy sounds like he could be a good customer for me.” So much better a quality of lead than some guy in Costa Rica who doesn’t know what the hell he’s doing; or some guy in the Philippines doing some stupid survey. I question an accredited investor (or any investor) who has money that would take time out and really expose his financials and say, “Oh yes! I have least a million – not including my own” to a total stranger. Or “Yes! I’ve got a 425 to 50”. If you think that those are the type of leads that are going to work just because they’re cheaper, you’re going to be deeply disappointed and you’re going to end up back at my website again. I Don’t want to sound too arrogant, but after 26 years of selling lead lists with an A+ rating and no complaints – if that doesn’t impress you. I don’t know what else to say to convince you. I’ve done a great job and I’m a one man operation. I’m the only guy going you’re going to talk to (other than my right hand woman) that’s going to write up the invoice. If you would like additional information, feel free to give me a call, John Fischer, at 561-981-8777. I look forward to speaking with you.